Made today in following with my Myst III and IV soundtrack redesigns. Last edited by Yali on Mon Oct 06, 2014 7:46 pm, edited 2 times in total. Looks nice! 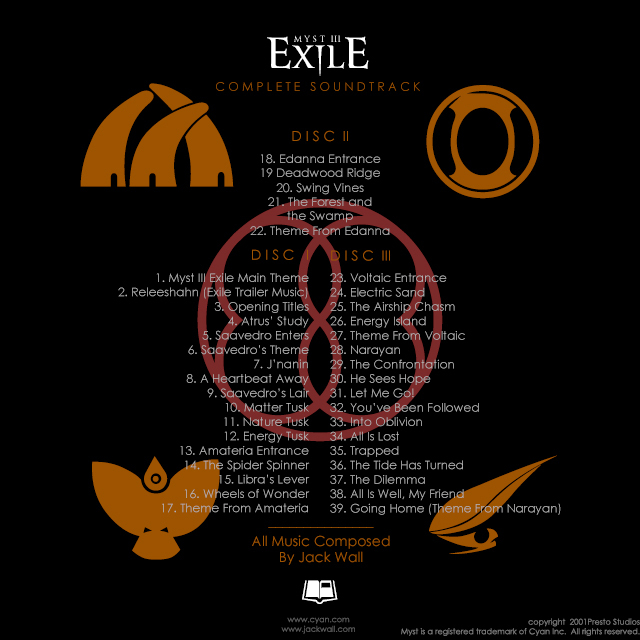 The Uru Soundtrack that I have doesn't have the second disk, though. All these tracks can be found in the Uru sfx folder and minus some of the tracks from the original ur su CD and two tracks only available on Gehn Shard. By the way, I think Cyan should hook up with vinyl distributors and release all the soundtracks in their complete form on record. I'd love to have these as a big multi-disk LP colection. I shop at a lot of record stores and the soundtrack section is booming. Myst has always had such mindblowingly good soundtracks to boot. If I may ask.. Compass Rose, same track from Myst? I've pulled every track I could find out of Uru and Myst 5.... I even set the 'Good ending' speech by Atrus to the 'Dragon Theme' from The Manhole Masterpiece edition... heheheheh, thanks Steam for the ol' Cyan complete pack. Just to make sure I have everything... Where would "Fehnir House" and "Vothol Gallery" be heard in-game? Umm... and what is the 'interview'? Is there an interview audio track hidden somewhere in the game I haven't found? Compass Rose is the 30 second track heard on the Minkata compass. Fehnir House and Vothol gallery can be heard in their named locations on Gehn Shard. Interview is a short piece of music that is only on the Ur Su Uru Music album by Cyan/Tim Larkin released in 2003. I understand that I am freakishly late to the party on this one. The previous update to this thread was 4 years ago in 2014. I humbly request your assistance in finding these "lost Myst Soundtrack Songs". I am a huge fan of the music from Myst. I actually listen to the complete Myst Soundtrack twice a year, every year. In August and February. I start the the audio recording of the reading of the Book of T'iana and the Book of Atrus. You know the ones from Randomhouse from back in the early 2000's that were released on audio cassette. Then I listen to the Myst and Riven Soundtracks, Then I listen to the Book of D'ni, then i listen to Exile, Revelation, URU, End of Ages, and Obduction. I really really REALLY look forward to this event every year. I seriously just stumbled across this thread (obviously 4 years late, hopefully not TOO LATE) You guys simply have to help me out with how to find these missing songs that you have discovered. I offer a trade. I have a couple songs that Robyn released online for Myst and Riven well after the Myst and Riven Soundtracks were published. I would be more than happy to share these with anyone and everyone who would graciously tell me how to extract these lost songs from Exile, Revelation, and URU. From the Myst soundtrack: "Myst Suite"
From the Riven soundtrack: "Riven Ghen"
I do not remember the forum. I even went as far as to contact Robyn via Twitter and he confirmed that one of the songs was indeed his work. He was not sure on the other. P.P.S. : I'm not asking any to share the songs with me. I just want to know how to find these exact songs you have listed on the fan-made soundtrack artwork and extract them myself. Have you tried YouTube "game soundtrack" ? As it's been mentioned, most of the Uru soundtrack is in OGG format in the SFX folder in the game's install folder - just sort the files by size and most of the music ones should be grouped together. I think there are a few Yali didn't mention in his list of tracks (like the Ahnonay Fall one). The game also contains a few shorter music tracks that play randomly in a few Ages (like in K'veer or Er'cana). It also works for Myst V. There are less unknown tracks, but I think I remember srlnBubbleMusic or something which plays when you solve Noloben. And a few ambiance musics (like the one that plays in the caves below Noloben). The Fehnir House music comes from the Fan-Age of the same name (you have access to the Age using the Gehn Shard, or by downloading it for Uru CC). The same goes for Vothol Gallery (it's worth noting the Vothol music was actually made by Mank, who has some other nice albums, although they sound less Myst-like). 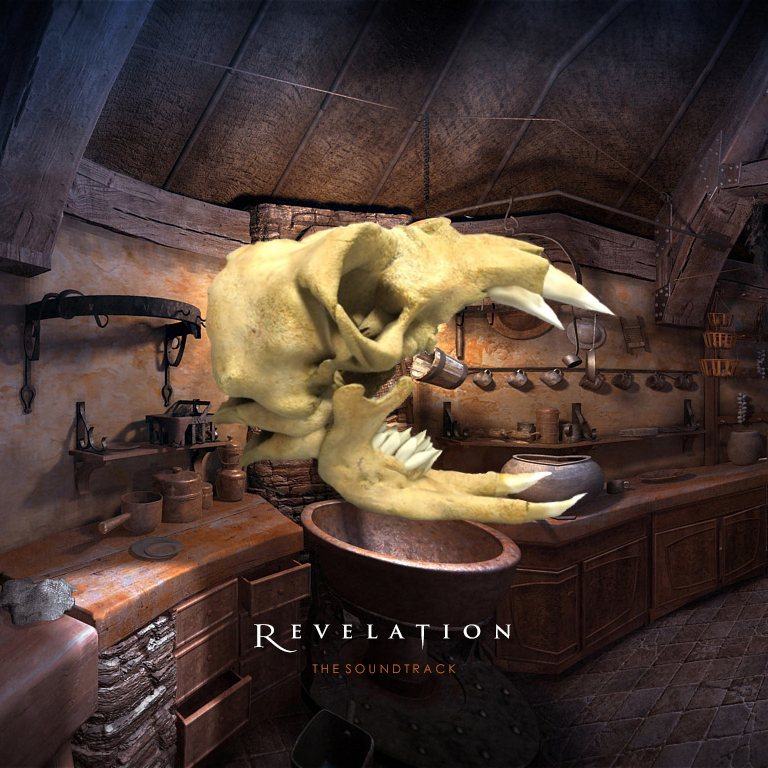 The only Revelation music missing from the OST is the trailer music, but it can probably be found on Youtube (didn't check yet). There are a few Exile music I'm missing, but I don't know where they are from. 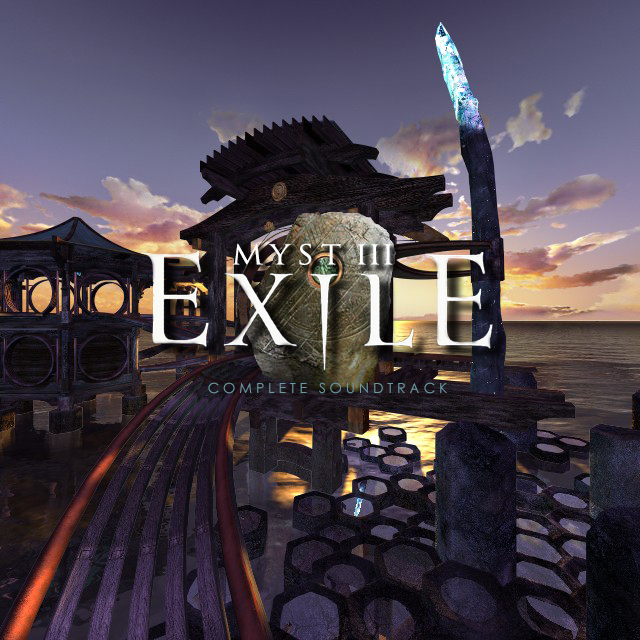 Like in Uru, Exile's music can be found in the game's install folder, however each music is split in SEVERAL tracks, unlike in the OST for which they were merged into full-length songs. 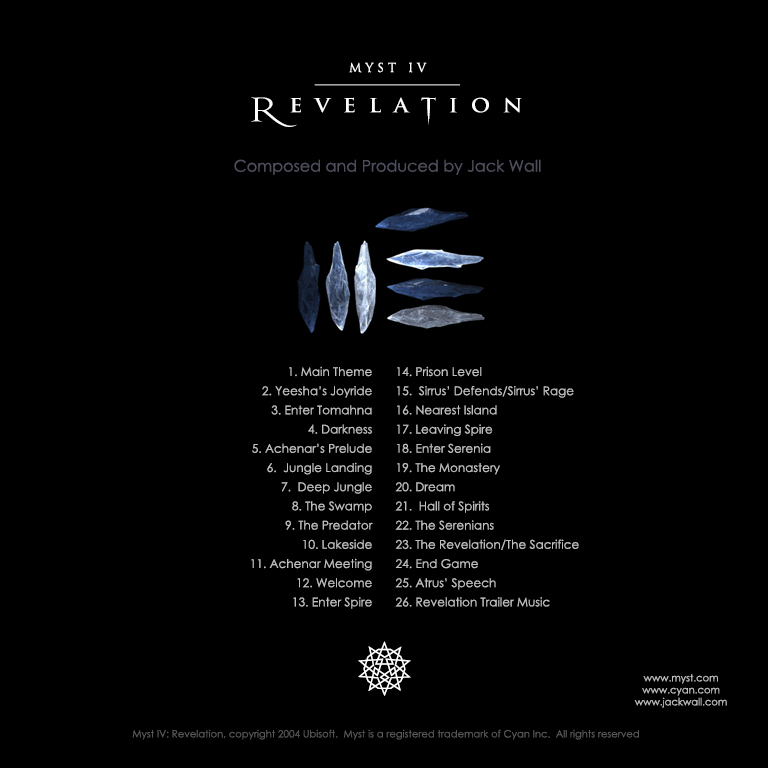 I have the Myst Suite and Riven Gehn you mentioned, very nice tracks indeed... I also have the realMyst trailer music, which is worth checking out (from the "they are real" trailer, but without the voiceover). I also have the three Rime musics (once again, can be found uncompressed into the original realMyst install folder). I recall they weren't named, so I gave them the name "Snowfall", "Riven" and "Crystal Monitor". And if that's your thing there are also a few related but non-official or non-Myst tracks lying around that weren't mentioned, and yet are pretty good... Click if that interests you. The Crowthistle demo has two music pieces which I think were made by Tim Larkin. One of them is pretty good, but I don't really like the other. 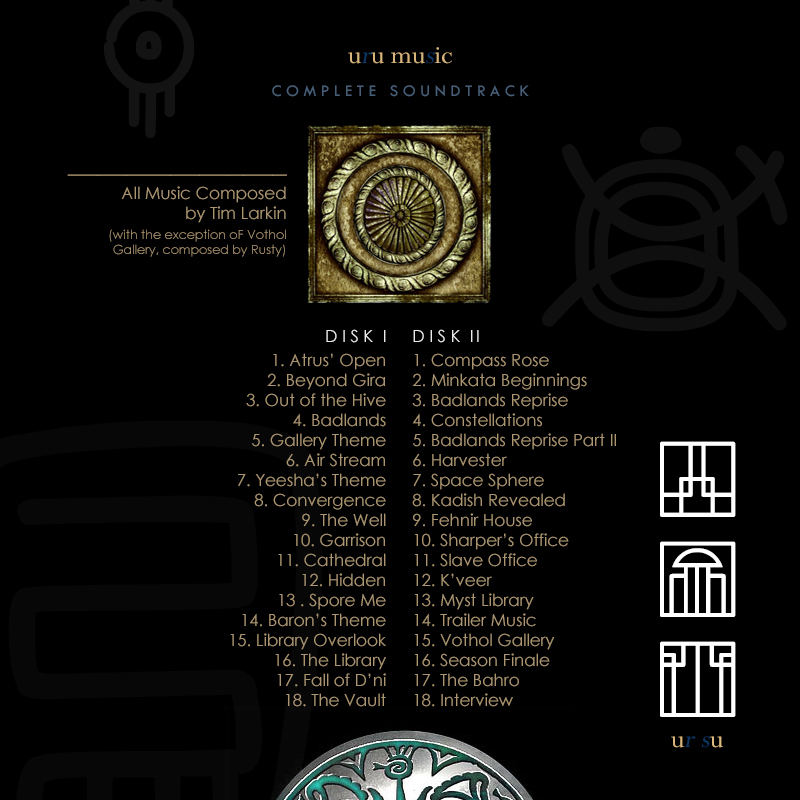 Yali (who made those covers) also made a music replacement mod for Myst V. This is really a mix of other game soundtracks, but works really well and completely change Myst V's feeling. Personally I really enjoy it as much as the official soundtrack. 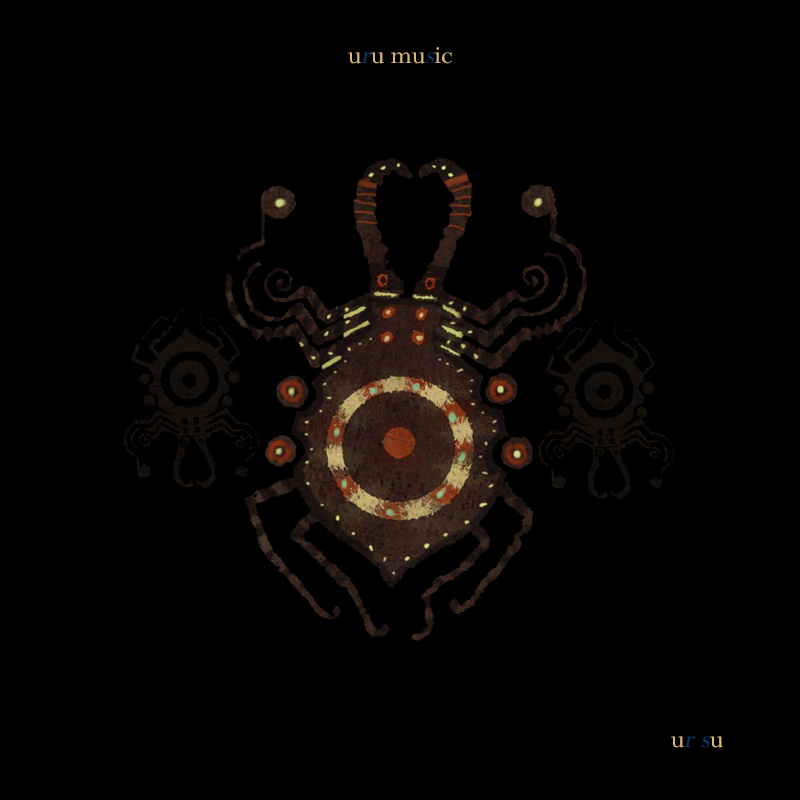 There were some nice musics in those Uru CC Fan-Ages: Writers' Nice, Tsoidahl Prad, Relativity, Tehr Dovah, and a few others. There were also two nice musics in the solution video for an Uru mod. Couldn't find the original though, but I didn't really look. Once I locate the files in game installs how do I identify which song they are? Do you, or anyone, know where the Exile, Revelation, and End of Ages versions of these? Thank you Artic_Wagon but the songs mentioned by Yali's post posted on Mon Oct 06, 2014 1:00 pm don't always line up with what is found on YouTube. I should have rephrased my question to "I'm having trouble lining up the songs found on the game installs with the names that Yali uses in his updated song lists on the previously mentioned post. As I am sure i can locate the files in the game installs I have no way of connecting the found game files against the names of the additional songs from the updated song list"